You’ve spent years (maybe even decades) building up your business, but that chapter of your life won’t last forever. 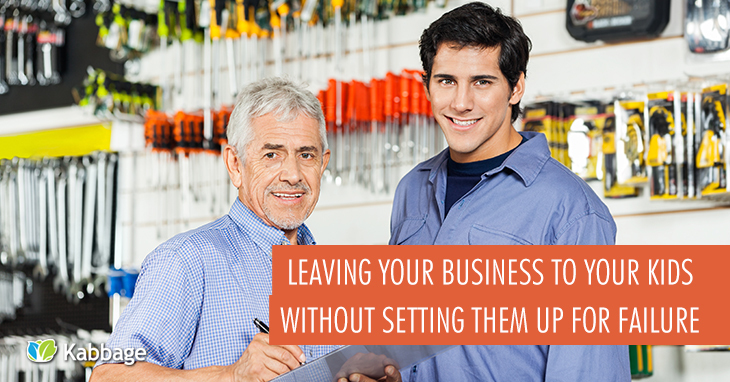 Whether you want to retire, leave a legacy or simply plan for what happens after your death, successfully transferring business ownership to your children takes more than a little thought and planning. Done right, it can ensure income, security and a chance to make a difference for the next generation. Done wrong, it can lose both the business and good relationships between your kids. Really, doing it right is so complex and time-consuming that it’s far beyond the scope of a simple blog post. But we’ve gathered enough information to help you ask the five biggest questions, and point you toward likely sources for the answers. If you have only one child, and that child both wants to run the business and is qualified to run the business, this decision is easy. If none of those three things are true, transferring business ownership becomes far more treacherous. Choosing early and grooming that child is the best solution for this problem. This helps you identify who is truly passionate about the business, and gives you time to make sure he or she is prepared for the role. What kind of training, experience and mentoring goes into grooming will vary from circumstance to circumstance, as will how to choose one child without hurting the feelings of those not chosen. Another consideration with no easy answer is how to disburse profits among multiple children. The business may have been profitable enough to support your family, but can it support the families of all of your kids? If the answer is “no,” how do you fairly distribute profits while taking care of the child who steps in to run things? The best plan is often to give the business only to the child who takes over leadership, and leave other assets to the other children. If nobody wants to run the business (or too many people want to), seriously consider arranging for a competitor or key employee to buy you out upon your retirement or death. The money from the sale is much easier to split without rancor than the operating business. How Do I Draft the Business Estate Plan? Your business estate plan is (mostly) just like the estate plan for everything else you leave to your children. Because your business is almost certainly one of the most valuable assets you leave, and even more likely to be the most complex asset you leave, your business estate plan should be something you treat as a project of its own – not just an addendum to or section of your full estate. Take a full inventory of the business’ assets and liabilities. This should be reflected in your P&L and similar financial reports. Decide which assets the business will keep when you leave, and which will remain. Identify all key roles in the business you fill personally. Choose instructions for filling those roles, being as precise as possible whether or not one of your children is filling that role. Assign Power of Attorney to an individual you trust to make decisions after the fact if you are incapable of deciding on your own. Include these instructions in your will. Most families that own a business have the majority of their assets in the company, so asset planning is an important factor. Many people worry about the estate tax (a.k.a. “death tax”) that theoretically could take nearly 50 percent of the tax value of the company. An estate must exceed $5.43 million per person ($10.86 million per married couple) before it’s even subject to an estate tax. Your kids might still be on the hook for some cash income from your estate, but only if they cash in stock in the business. If your estate’s value does exceed the estate tax exemption level, you can arrange to gift your children stock while you’re still alive, and avoid the taxation. Some sections of the tax codes are written specifically to reduce the burden of estate taxes on inheritors who receive part of a family business. You can redeem stock at a reduced tax burden under Section 303, or pay the estate taxes over time under Section 6166. Estate taxes on the family business are only a problem if they hit you by surprise. Careful planning, and execution of that plan, are all that’s necessary to avoid this issue. Do I Need Legal Documents? Yes. The answer is yes. Specifically, which documents depend on the location of your business, the complexity of operations and exactly what you want to see happen. A section of your will is the most common legal document required, though many estate lawyers recommend a living trust instead. A living trust sets up a situation where the trust itself is the legal owner of the business. You still retain control over all funds and decisions, but when you pass on or retire the business doesn’t go into probate (and thus doesn’t suffer all the potential complexities and problems associated with probate). When the time comes, control of the trust transfers to the person you designate in the trust setup documents. Ownership remains in the hands of the trust itself. Should I Do It Myself, or Hire a Professional? These are some of the most complex and important documents and decisions you will make regarding your estate planning. The best advice is to hire a professional in transferring business ownership, unless you are personally professionally qualified to do this yourself…which really amounts to hiring a professional anyway. You may have noticed you can’t follow all of the above advice without spending money. If your plan to leave your business to your kids requires more funds than you have on hand, a small business loan from Kabbage can help. The last thing you want to do is make this the last thing you do…success by any metric relies on these details being in place before you need them to be.